Global Mobile, an expert in mobile marketing infrastructure, has a vision of transforming the way America votes. Leveraging QWASI’s core technology Global Mobile and Contra Costa County were the first test mobile to activate voters and election workers. Research shows teenagers are less likely to register to vote. But now there is a new mobile texting platform designed to get them involved at an early age. 2Vote is a mobile way to encourage young people to participate in the electoral process by taking the first step — registering to vote via text. The idea is to get to teens where they live, which is on their smartphones. Contra Costa County is the first in the country to launch the 2Vote program. “You text in your school name in the field where you would normally be sending in a text and the number field you just type in 2Vote,” said Paul Burgarino, with the Contra Costa County registrar’s office. 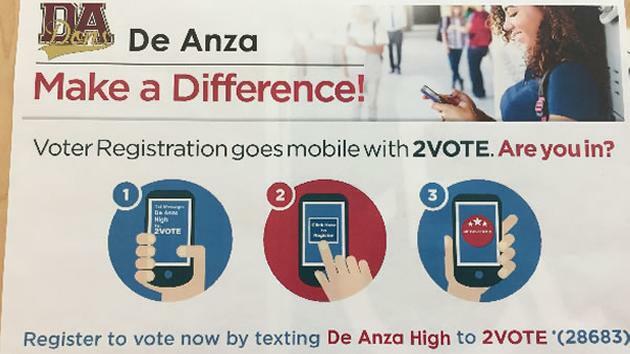 Students simply text their school name to 2Vote (28683) and they get a return message with a link to the county registrar’s website. The program will be disseminated to schools in 50 counties in California and potentially across the country. High school students in Danville told said they like the idea. “I have not registered to vote yet. I think if I could just do it on my phone it would work out a lot better,” said Nolan Henry, a high school senior. “I want to be able to complain because everyone says that if you don’t vote, then you shouldn’t have anything to complain about, so I want to be able to complain,” said Tacherra Jones, a high school sophomore. Right now, young voters register and vote at lower rates than older adults. In last November’s presidential election, more than 60 percent of 18 to 24 years old in Contra Costa County were registered, but only 33 percent actually voted.